First, I’d like to encourage you to visit our Historic Slaton and Harvey House Gallery because there are quite a few new additions there. Ultimately I’d like it to be the most extensive, usable and expanding gallery of historic Slaton images, including identifying captions. Without captions, it is just a bunch of old pictures, but that part takes a while. One benefit of doing this is that occasionally I’ll spot a family member in pictures I’d never seen. 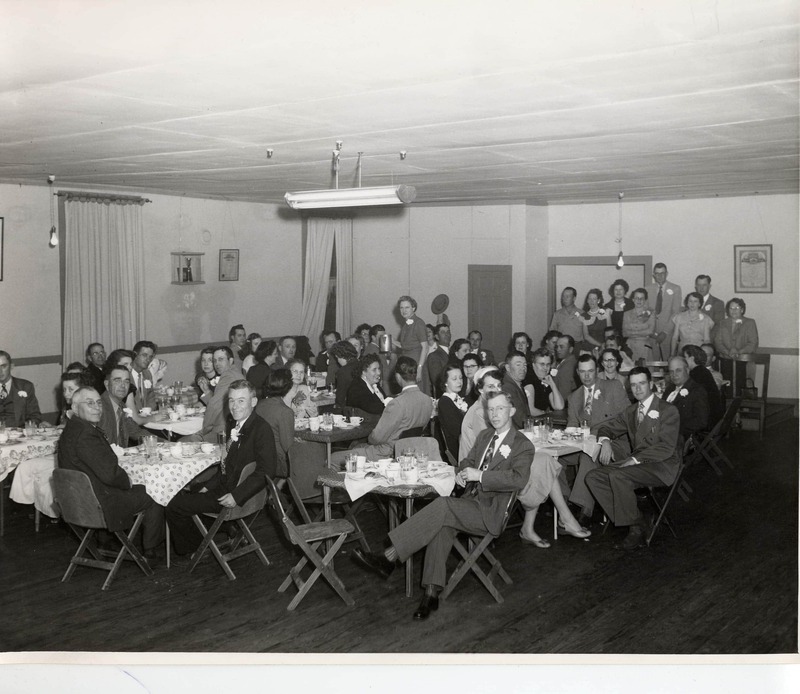 Today while examining the picture below of “1940s Dinner Upstairs” I spotted my grandfather, Erskine Culver (seated closest to the photographer) and a moment later my grandmother Birdie (walking behind those seated). I also found this head shot, which is great because our family doesn’t have many good pictures of him. 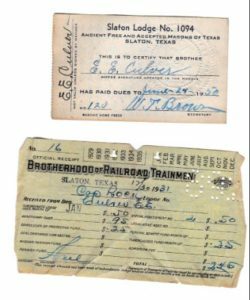 Erskine served on the Slaton Santa Fe as a brakeman and conductor for about thirty years, as best I can tell. His union dues receipt (below) is from 1931, but he likely started earlier than that. He worked until his early death by heart attack at 57. I never heard many stories about Papaw, mainly that he was a nice guy with a quick laugh. His nickname was Straw because of his red hair. 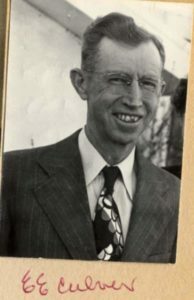 Born in Alabama in 1899, he was raised in Mount Pleasant. More than likely it was the Santa Fe that brought him to Slaton, like it did so many. 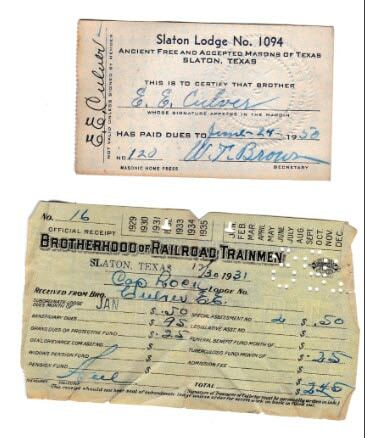 He was active in the Texas Masons (membership card below), Eastern Star, church and–apparently–something called the Dinner Upstairs. It occurred at 140 S. 9th, now a shuttered building across the street from OD Kenney. I don’t know if it was a regular thing or once only, but isn’t it interesting to see how formal a small-town gathering was then compared to now? Erskine Culver, lifetime Slaton Railroader, died before I was born so unfortunately we never met. His two sons, Harold and Tip, both followed his footsteps with Santa Fe careers in Slaton. I’m glad to be able to add him to our historic gallery today. If you have a pioneer friend or ancestor you would like to see included here, whether or not they were associated with the Santa Fe, please send me an email at gculver@ebrainsinc.com.